Ms. Linda Patterson worked closely with Dr. Peter Ellis, loaned executive from the W.K. Kellogg Foundation, and Dr. Joel J. Orosz, (Dr. Ellis’s successor) to create and implement the major strategies for increasing and improving philanthropy in Michigan. Following the lead of Dorothy A. Johnson, president and CEO of the Council of Michigan Foundations (CMF), Ms. Patterson provided the staff support for the Increasing and Improving Philanthropy Committees of CMF. Her leadership helped launch the Michigan Nonprofit Association, Campus Compact, the Center for Philanthropy and Nonprofit Leadership at Grand Valley State University (now known as the Dorothy A. Johnson Center for Philanthropy), and several other smaller (but no less important) strategies to strengthen philanthropy in Michigan. Ms. Linda Patterson talks about her career in philanthropy. Ms. Linda Patterson talks about her concerns for the field, which include a fear of risks. Ms. Linda Patterson talks about the history of the Michigan Nonprofit Association. Ms. Linda Patterson talks about the benefit of working with local community leaders. Ms. Linda Patterson talks about the history behind Michigan Campus Compact. Ms. Linda Patterson talks about the history and mission of the Increasing and Improving Philanthropy initiative. Ms. Linda Patterson talks about the growing popularity of academic centers for philanthropy. Ms. Linda Patterson talks about the development of the Governor's Service Awards. Ms. Linda Patterson talks about the dedication of staff and volunteers in the nonprofit sector. Ms. Linda Patterson talks about the incredible leadership of Russ Mawby. Ms. Linda Patterson talks about the value of incubating new projects and deciding which ones are worth the time, money, and effort. Ms. Linda Patterson talks about the culture of cooperation within Michigan's nonprofit sector. Ms. Linda Patterson talks about the Council of Michigan Foundations (CMF) educating donor families about formal giving programs. Ms. Linda Patterson talks about learning to be patient with public policy work. Ms. Linda Patterson was born, raised, and educated in Michigan. She graduated from the University of Michigan with a Bachelor of Science degree in dental hygiene in 1963. Subsequently, she split the responsibilities of practicing in a private office with also serving as a clinical instructor in the dental school. Ms. Patterson’s first experience with formal philanthropy came when she was hired by Ms. Dorothy (Dottie) Johnson to work at the Council of Michigan Foundations (CMF). While at CMF, Ms. Patterson led both the Improving Philanthropy Committee and the Increasing Philanthropy Committee, which looked for ways to improve access to, resources for, and overall understanding of Michigan philanthropy. Patterson and the committees worked to address some of the challenges facing Michigan nonprofits, including changes in tax laws, staff/volunteer liability, and reduction of federal support. In particular, Ms. Patterson recalled that the group wanted to find ways to develop “advocacy for families of wealth to form some sort of formal giving unit and secondly, for there to be more academic and community support for formal giving.” This would later become known as Advisors to the Wealthy, a partnership with The Philanthropic Initiative (TPI) of Boston, to create resources that helped financial advisors provide guidance on philanthropic giving options and plans for their clients. In addition to Advisors to the Wealthy, the Improving Philanthropy Committee played a role in developing: 1) the Michigan Nonprofit Association; 2) Campus Compact; 3) academic training programs that grew into the Center for Philanthropy and Nonprofit Leadership at Grand Valley State University; 4) the K-12 Education in Philanthropy program (now known as Learning to Give); and 5) the annual Governor’s Service Awards. The committee saw great potential for increased collaboration between existing Michigan nonprofits. An umbrella organization for nonprofit organizations was formed, now known as the Michigan Nonprofit Association (MNA). At its founding in 1990, MNA sought to encourage voluntary giving and service, disseminate information, advance public policy, and build nonprofit capacity. Ms. Patterson’s team was also influential in bringing Campus Compact to Michigan. The group recognized the need to strengthen student and youth volunteers. As a program within the newly formed MNA, Campus Compact helped to formalize how volunteers were trained, recruited, and retained, ultimately providing a strong pool of volunteers for local nonprofits to engage. Finally, Ms. Patterson and committee members increased nonprofit awareness by starting the annual Governor’s Service Awards. Since 1994, this award has honored individual volunteers who have made a significant impact on their community, in recognition of their achievements and helping to promote nonprofit accomplishments across the state. Ms. Patterson currently serves as the executive director for the Dyer-Ives Foundation, a family foundation, which seeks to build capacity in organizations that address issues of systemic poverty, or that work to diminish a sense of isolation among residents of the central city of Grand Rapids, Michigan. 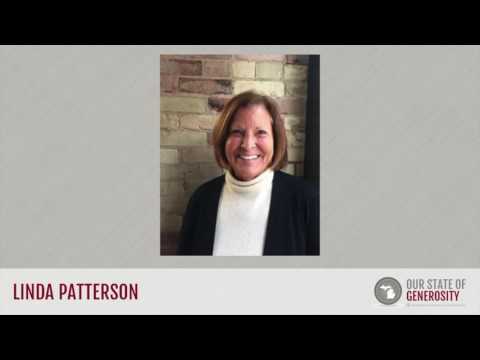 Ms. Patterson was interviewed regarding her insights and experiences working with Michigan’s philanthropic community and the Our State of Generosity (OSoG) partners. The following are selected quotations from her interview specifically related to the five organizing themes of the OSoG project. “I think most of the programs that I have seen the Foundation participate in that would be innovative at all – and would have a long-lasting impact – have been because of those relationships and knowing the right people to tap, the right people to ask their opinions of, and getting that variety of culture, of education, of economic level.